*included donation of $10 per card. Really pumped about these 2 coming back to me as I had followed this address on a hunch. At his website http://www.ericdickerson29.com/# it states very plainly that he does not sign free autographs, so I sweetened the pot a bit to see if I could game a response. It worked like a charm and I was shocked to receive a response in such a short time, as both of these cards were ones I really wanted signed. The Skybox was just a great photo of Dickerson. It really screams ‘poster card’. The Action Packed Rookies 1992 is from a set that I unabashedly collect. 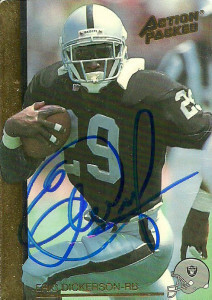 It is from his one season with the Los Angeles Raiders and I wouldn’t have gotten it signed otherwise. I had decided to write Eric after going to the Houston Fan Fest this year. We were driving through Sealy, Tx on the way home from the event and passed by the stadium he ran to High School glory on, which prompted me to start thinking about Eric’s legacy. A few days later Eric got into a brouhaha on Twitter with an unnamed child musical artist who can’t seem to drive safely in their shared neighborhood. I took it as though fate was slapping me on the face and took pen to paper that evening. Dickerson is unabashed when asked about Adrian Peterson’s recent run at his record 2,106 single season rushing record, and said that he’s glad he still holds the record. While other more… let’s say modest… players might say otherwise, I actually agree with Eric. There are certain records that I hope never fall again. Some things such as 2,106 should stand the test of time, and I am glad Dickerson (HoF Class 1999) holds it. Eric is also a member of the 2,200 strong NFL alum that won litigation against the NFL for concussion related injuries. His name is the largest name in the hat, statistically, as he piled up over 13,000 rushing/receiving yards in his career. At this time he does a lot of charity work, speaking, and golf tournaments to pass the time. Back in the days of the Los Angeles Raiders, I would actually get excited when I heard they signed somebody like Eric, because I knew that player would be at the Cowboys training camp later that year. I don’t think I missed a day at Cowboys training camp that summer, and I never wanted to miss an opportunity to double my chances when the Raiders came to town. 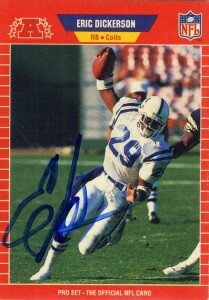 Eric was much maligned in the media by now because of frequent contract disputes with the Colts over the last year or two but he was more than generous signing 2 cards for me during camp that year. 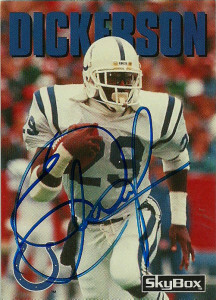 Dickerson would play 11 seasons in the NFL for the Rams, Colts, Raiders and Falcons. 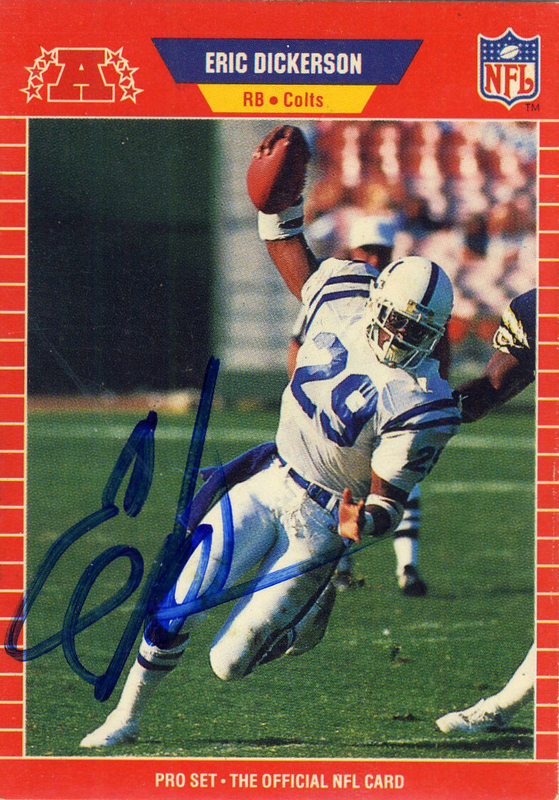 A spectacular runner at SMU where he formed the “Pony Express” with Craig James, Dickerson was drafted by the LA Rams in 1983 and went on to set rookie records across the board, and finished as the ROY that year. In his second year, Dickerson established the record for most rushing yards in a season with 2,105. In ’87 he was traded to the Colts where he continued his streak of 1,000 yard seasons playing until he signed with the Raiders in ’92, and finished with a brief stint in ’93 with the Falcons. 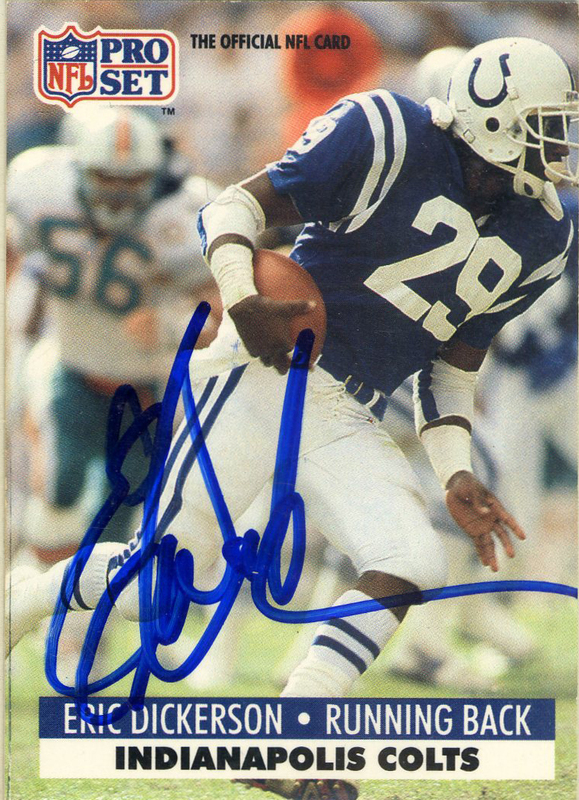 Eric’s career totals included: 6 pro bowl selections, 5 first team all pros, named 1980s all decade team, 1986 offensive player of the year, having his number retired by the Rams, and elected to the HOF in 1999. Post football Dickerson has been both a sideline reporter for Monday Night Football and also on KCBS in LA.